Stephen W. Terrell's (MUSIC) Web Log: TERRELL'S TUNEUP: Viva Los Nuggetz! 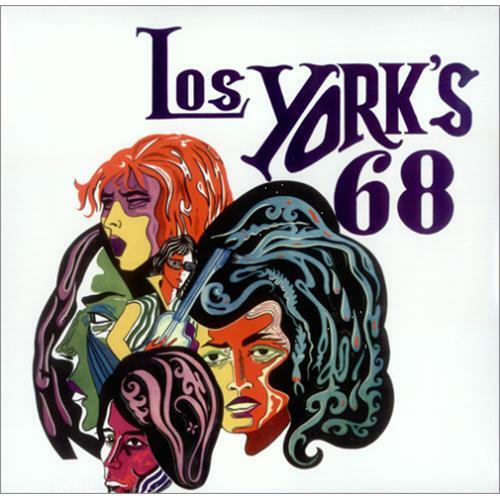 At the same time that Hispanic Americans like Sam the Sham, Question Mark & The Mysterians, Cannibal & The Headhunters, Thee Midniters and – of course, Carlos Santana were making their individual marks on what later would be known as "garage rock," there were bands in Mexico, Peru, Uruguay and other Spanish-speaking lands who also got the rock ‘n’ roll juju. Although groups like Los Pets (Venezuela), Los Ovnis (Mexico), Los Holys (Peru) and Kaleidoscope (Dominican Republic) never got well known far beyond their native regions, they rocked with abandoned. And Los Nuggetz even has Spanish-language covers of Mexican-American garage classics like Sam the Sham’s “Wooly Bully” and Question Mark’s “96 Tears” (appearing here as “Bule Bule,” and “96 Lagrimas,” both by the Peruvian band Los Shains). Some historical context: The basic story of 1960s rock 'n' roll is that British kids got fired up up on American blues, R&B and first generation rock 'n' roll and thus created the British Invasion bands we know and love. Americans reacted by forming unknown numbers of new bands, and thus was born garage-rock psychedelic music, proto-metal, proto-punk, etc. And all of this spread across the world as rockers virtually everywhere adapted, mimicked and put their own stamp on the popular music coming out of the U.S. and the U.K. Many don’t realize how popular this decadent Western music was in unexpected corners of the world. And unless you're a fanatical record collector, chances are you've never heard or even heard of many 1960s rock 'n' roll groups from non-English-speaking nations. In recent years there have been some CD compilations that have attempted to document garage rock and other raw pop sounds from around the world. In 2001 Rhino released a 4-disc collection called Nuggets II: Original Artyfacts from the British Empire and Beyond, 1964-1969 -- though the lion’s share of these were from the United Kingdom and nearly all the songs were in English. Then, to get a little obscure, there was the 11-volume World Beaters series, which sprang up early this century on a mysterious label called Krazy World. Now out of print, World Beaters featured garage rock from all over the world. Even Papua New Guinea was represented. It was the World Beaters CDs that first got me acquainted with Los Shakers, Los Shains, and Los Salvajes, who now appear on Los Nuggetz. Geographical grumble: Despite the subtitle, a big number of the songs on Los Nuggrtz technically are not from Latin America. Many are by groups from Spain, which isn’t part of America, Latin or otherwise. But in the long run who cares? " 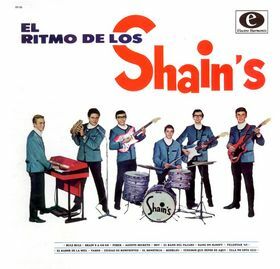 Me Reire" by Los Shakers (not to be confused with the Argentine Los Shakers, also on Los Nuggetz), a song that sounds like a mutation of Them's "Mystic Eyes," as well as Los Salvajes' covers of "Paint it Black" and "19th Nervous Breakdown" are among the highlights of this collection, so I’ll just shut up about that. Compiled by James Austin, a former producer at Rhino Records (remember back when Rhino was the coolest name in music reissues? 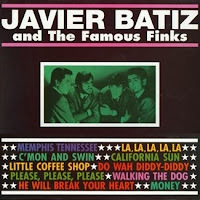 ), Los Nuggetz includes many tracks that have never seen reissue. And it comes in a very attractive package -- a 70-page full-color hardcover book featuring the images of a psychedelic skull sharing smoke with an Indian as well as a masked luchador!) And there are extensive liner notes by Randall Wood detailing each and every song. But the music, of course, is the main draw. It’s definitely not as polished as the recordings of the American and British bands that inspired these groups. But most the tracks here capture the raw enthusiasm of the Nuggetz musicians – many of the players being teenagers when they went into the studio. Many of the songs on this collection present a virtual alternate reality of ‘60s pop. You don’t have to speak Spanish to recognize a huge number of the songs here. There’s a plethora of covers made famous by rock and soul icons like James Brown, The Beatles, The Kinks, The Four Tops (not one, but two versions of “Reach Out, I’ll Be There”) and The Doors. One of my favorite covers here is “See See Rider,” done by Los Pops (Spain) in an arrangement based on the version by The Animals. 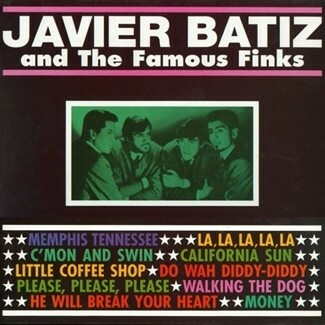 There are Spanish remakes of hits of the day including Nancy Sinatra’s “These Boots are Made for Walking” (by Gloria Benevides of Chile); The Rivieras’ “California Sun,” reworked as “Tijuana Sun” by Javier Batiz & The Fabulous Finks; and The Crazy World of Arthur Brown’s “Fire,” as done by Los Sirex from Spain. 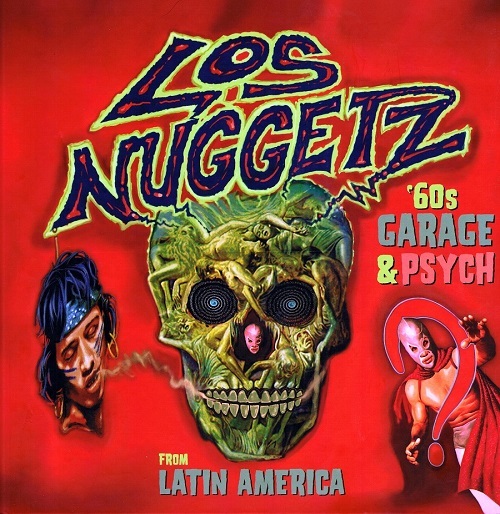 Los Nuggetz also features covers of classic garage hits like The Trogg’s “Wild Thing,” sung by Juan “El Matematico” Garza from Mexico under the title “Loco de Patina el Coco); Them’s “Gloria” performed by Columbia’s Los Young Beats; and a ferocious take on The Leaves’ “Hey Joe,” by Los Locos del Ritmo, (Mexico). While covers dominate this album, among my favorites are originals. The best are “El Psicodelico” by Los Yorks of Peru, the even-more psychedelic “Colours by Kaleidoscope, and the Joe Meek/13th Floor Elevators-influenced instrumental “Sueno Sicodelico” by Los Holys. While most, if not all of these bands broke up decades ago, there’s plenty of noise still rocking the garages of Latin America. If you like Los Nuggetz, I suggest you check out contemporary groups like Los Peyotes from Argentina, Los Vigilantes from Puerto Rico, Horror Deluxe from Brazil, Los Explosivos from Mexico – as well as Spanish bands like Wau y Los Arrrghs!!! and The Hollywood Sinners.